As the weather cools down, the ability to wear sparkles during the day increases, culminating with the Holidays and New Year's Eve. Are you ready to pull out your bling for daytime? I am hoping to add some excitement to my chunky sweaters with sequin collars, and glitzy clutches. What are your thoughts on sequins, glitter, and shine for day light hours? I have the cutest silver sequin clutch that I've worn to dressy occasions at night (formals, weddings) but I've never figured out how to pull it off during the day! I'm all about the "Glitz Before Six"!! Bought a new sparkly top today as a matter of fact! As long as you do it properly, sequins during the day is totally acceptable! 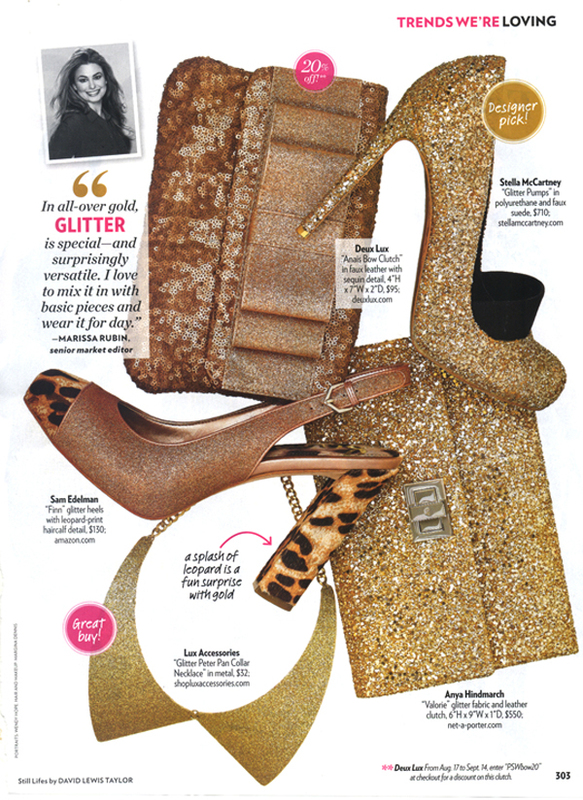 I have gold sparkley shoes and I am sooo glad they are in because I am never brave enough to wear it! Definitely want to get into the sparkle trend! Need to find some pieces to integrate into normal wear! LOVE it! Dress it down a bit with something overly casual and its perfect. Oh my goodness... that is the cutest phrase! I hope you don't mind, because I am totally stealing it! Sounds like the perfect amount of bling! Definitely time to start breaking out the sparkle! I know you can rock it!